It wouldn't be Christmas without an impossibly-hard-to-find Nintendo console. 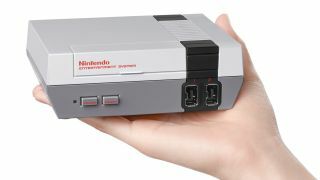 The miniaturized nostalgia trip of the NES Classic Edition has immediately sold out everywhere, and the company is still having trouble supplying enough units to meet demand (Remember the Wii? How about amiibo?). But if you’re still hoping against hope that you’ll get your hands on one this holiday season, then here’s a handy rundown of all the games that the system has to offer and which ones are worth your time… along with the ones that aren’t. Whether you’re brand new to these titles or coming back for another round after a few decades, we’ve ranked them all from worst to best based on how they’ve stood the test of time. Ice Climber is an arcade-style platformer with a singular goal: break the ice to climb the mountain. Plenty of games can derive a ton of fun from such simple concepts, but Ice Climber is not one of those games. The rigid jumping and near-useless hammer attack make you feel like you’re fighting with the game rather than playing it, and ascending the same mountain (with minor changes to platforming and enemies) for level after level leaves you downright bored – even when you succeed. With such uncomfortable and disengaging gameplay, it’s pretty hard to imagine someone enjoying any part of this game nowadays. Castlevania II is a game that wasn’t even good for its time, let alone in 2016. It is still fundamentally an action platformer, retaining the stiff movement and attack controls of the original Castlevania, but Simon’s Quest trades deviously smart level design and exciting bosses for a disjointed overworld and incomprehensible puzzles. At first, the game simply drops you into an unknown town with a bunch of useless NPCs who spout nonsensical “clues” about where to go and what to do. You also realize that the gameplay loop mostly involves wandering around and killing random enemies to gain currency for buying unexplained items. On the off chance that you’re killed while out wasting your time like this, you’ll respawn right next to the thing that killed you and all your currency will be gone. Even once you have the right item and know where you need to go, navigating the overworld map to get to the right places is a convoluted nightmare, punctuated by a nightly “curse” that makes all the enemies twice as tough. Needless to say, this game isn’t worth the time it demands. Saying that a game is “kind of like Zelda” is usually a compliment – it implies that the game succeeds at doing at least one of the things that make The Legend of Zelda series so good. StarTropics is a game that resembles Zelda in some key ways, but fails to capture anything good about it. This strange top-down action adventure game transitions between exploration and dungeons, but in a mind-numbingly linear and simplistic way that leaves you unfulfilled at best and mildly irritated at worst. There’s no sense of control in the inflexible grid-based movement, and most puzzles just involve jumping on green blocks in the right order. Enemies and bosses alike are unoriginal and dull, and when the game has so little else to offer, there’s no good reason to continue playing it. The best thing one can say about Kid Icarus is that it’s a rudimentary, straightforward action platformer – most of the time. A lot of the game simply requires you to jump on sizable platforms with A, shoot the garden variety of enemies with B, and transition across each side of the screen as you climb out of hell. That wouldn’t be so bad if the platforming wasn’t so floaty, and if the fortress levels didn’t exist. Kid Icarus’ idea of dungeons are these needlessly drawn-out sequences of rooms with nothing of substance in any of them, and the game commands you to buy two different items in order to create your only map. As if that weren’t bad enough, Eggplant Wizards can hex you and turn you into a defenseless eggplant, forcing you to backtrack to a specific room. After you’ve trudged past all that, your reward is an underwhelming boss and more vertical platforming. I can’t fathom why I chose to beat this game as a kid. What is there to say about Pac-Man that hasn’t already been said? This version is one of the many home ports for the NES, and on one hand, that means it has a baseline of quality as an emulation of pellet-chomping and ghost-juking. On the other hand, it’s a far cry from the arcade original. The NES d-pad is absolutely not the ideal way to control this game – missed turns and frequent deaths become the norm when you can’t rely on the precision you would ordinarily need in Pac-Man. This port might draw the attention of the younger scene that are less familiar with this classic, but it won’t hold that attention for long. Zelda II is not so different from Castlevania II, but at least one can confidently say that it’s a generally better game. The Adventure of Link is an action RPG that retains almost nothing from the original Zelda’s formula. The way the shield and magic system work add a cool layer to an otherwise uncomplicated game, and it tries a number of other interesting ideas that just don’t work out. Still, that doesn’t make a gameplay loop that is so similar to Castlevania II any more fun. The overworld makes for a lot of aimless wandering, split into dungeons or towns populated by NPCs that either give cryptic hints about item requirements or just useless dialogue. Most dungeons include a lot of trial and error even after you have the necessary item and adequate level. This game also wants a fair amount of grinding from you – the leveling system depends mostly on minimal EXP rewards from killing enemies in random encounters, but those random encounters continue to throw enemies at you without giving you EXP for most them. Link’s momentum is also strangely slippery, which becomes a problem when the sidescrolling segments demand platforming in addition to combat. Even in this underwhelming arcade port, it’s hard to find something to actively dislike about a game like Donkey Kong. Mario’s simple actions of jumping, climbing and whacking things with a mallet still feel good for a game from 1981. That said, there isn’t much to this game beyond that. The NES version only has three of the mere four different levels that made up the original, and you can complete them incredibly quickly. They also loop after you finish them all the first time, so unless you’re planning to set the high score on your personal NES Classic Edition, you probably won’t get much replay value from this one. 23 - Donkey Kong Jr. Ghosts N’ Goblins is the only game on this list that you could call unfairly difficult. This action platformer has you playing as Arthur, a comically inadequate knight with a weak projectile and a stilted jump. His meager abilities seem like nothing in the face of all the enemies and trials that the game throws at you using some of the most malicious, quarter-stealing level design imaginable.You eventually notice that running and gunning is always more effective than playing smart, and god forbid that you get stuck with one of the terrible, permanent alternate weapons. Still, there’s an undeniable sense of satisfaction once you finally conquer each zone. The game also has relatively forgiving checkpoints, restarting you at the beginning of the newest area you entered before you lost all your lives. Y’know, so you can continue to beat your head against that same wall a bit more. As one of the original space shooters, Galaga is still an essentially simple but uniquely challenging experience – or at least it’s supposed to be. It’s not that this NES version of the arcade classic is necessarily bad; it’s just a noticeably different game from the more robust arcade version. For those who aren’t acquainted with the arcade version, that won’t matter much anyway.Galaga is unlike most other space shooters in that your accuracy matters more than your speed. You can only have two of your shots on screen at a time, and enemies will rapidly overwhelm you if you don’t aim. That said, enemy patterns do get predictable when they’re just slight variations on the Space Invaders formula. If you’re playing for anything but score, you won’t be getting much mileage out of this game either.